Made in ENGLAND Alnico Blue. This classic guitar speaker actually started life as a radio speaker that was modified specifically for use in electric guitar amplifiers. In its original incarnation as the G12 T530 it appeared in several colour variations, but it was the Blue version, fitted as standard into Vox AC30 amps, that secured its place in guitar tone history.The Blue found favour with notable guitarists like Brian May, due to its glorious dampened attack, warm lows, mellow upper-mids and brilliant bell-like top-end. When coupled with a suitable amplifier it evokes rich definition and develops beautiful musical compression when pushed. 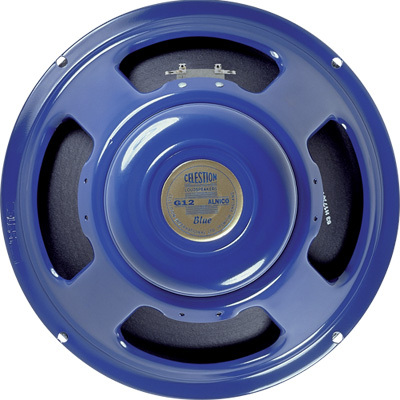 According to tone enthusiasts worldwide, the Blue is the benchmark for guitar speaker perfection.